For every home cook who wanders the aisles of the local supermarket asking the question “What do I want to cook for dinner?,” celebrated chef Geoffrey Zakarian—owner of the highly acclaimed restaurants Town and Country in New York City—offers two sublime recipes for each of his sixty-five favorite ingredients. Whether it’s just-in-season asparagus, a gorgeous steak beckoning from the butcher’s case, or the sweetest August corn that catches your eye, Zakarian helps you turn it into a quick weeknight meal or Sunday supper—a Country recipe—or elegant Saturday-night dinner-party fare—a Town preparation. 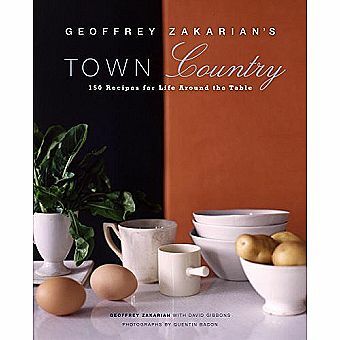 Featuring stunning full-color photographs and an approach that is at once familiar and fantastic, comfortable and creative, Geoffrey Zakarian’s Town/Country pre-sents the perfect combination for amateur to ambitious American cooks.